Down a drive flanked by moss-covered walls, two miles from Narberth town and just 10 minutes from where the leatherwork courses are held, is an old fortified longhouse in 25 rolling acres – pristine, peaceful and cosy. Here live two dogs, three donkeys, cats, ducks, hens and hosts, Rayner and Carol in Carol’s childhood home. 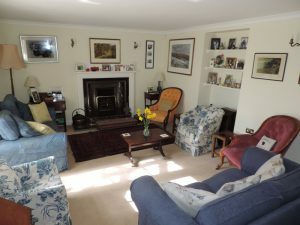 There’s a real fire to curl up in front of with a cup of tea and homemade cakes; books aplenty, equine paintings and fantastic art, and gardens and a lake to enjoy. 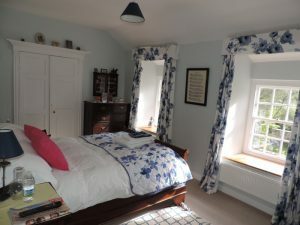 The décor is traditional, the bed linen immaculate and the views over the garden and to the Preseli Hills gorgeous. Parking: There is plenty of easy, off street parking. Breakfast is included in the price of accommodation. 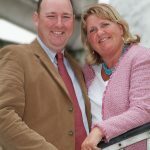 Pembrokeshire Farm B&B specialise in homemade, home grown and top quality local produce. Breakfast is served in the conservatory with views over the garden and consists of fresh fruit, yogurt, cereals or porridge, fruit juice, homemade bread and toast with our own honey, homemade jams and preserves plus a choice of cooked breakfast with locally sourced produce. A hosted 3 course dinner, informal supper or packed lunch can usually be provided if requested at the time of booking. With prior notice, gluten free, dairy free and vegetarian diets can be catered for. Facilities: There are two double rooms with king sized beds; one with en-suite shower room and the other with a separate, private bathroom with bath and shower. Bedrooms have Egyptian cotton bedding, TVs, bathrobes, slippers, bottled water, toiletries & a hairdryer; the guests’ drawing room has a TV, log fire and comfortable sofas and there are a wide assortment of teas, coffees & drinking chocolate, bottled water and homemade shortbread to which the guests may help themselves at any time during their stay. There is free wi-fi. 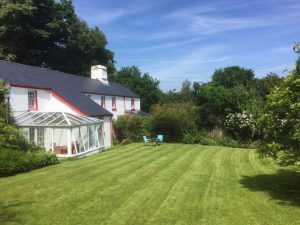 Pembrokeshire Farm B&B has been inspected and selected by Alistair Sawday’s Special Places to Stay and has been awarded a Tripadvisor Certificate of Excellence. When booking with Pembrokeshire Farm B&B please mention that you are attending a leatherwork course with us.